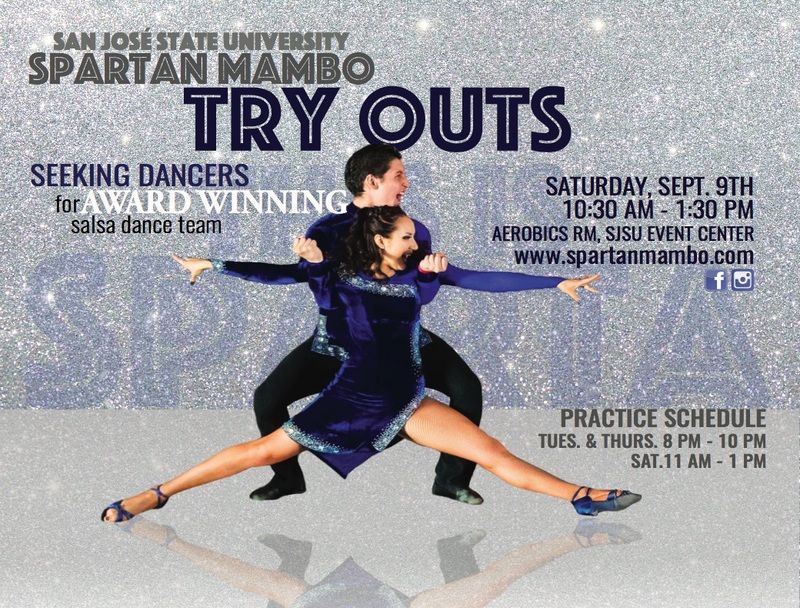 Spartan Mambo Fall 2017 Auditions Coming Soon! Auditions for the Fall 2017 are coming up! Our auditions for this semester will be held on Saturday, September 9th at 10:30am in the Aerobics Room in the Event Center. We are looking for both girls & guys and both experienced and new dancers to join our dance team. Learn to dance salsa, meet new friends, and have an incredible experience as part our SJSU’s salsa dance team! For more information see our Audition page and RSVP on Facebook if you’re interested in joining us! Want to find out what Spartan Mambo is about? Check out this highlight reel created by one of our talented alumni! If you are interested in joining our team, come to our auditions on Saturday, September 9th in the Event Center. We are looking for both followers & leaders to join our team for Fall 2017 and beyond! No experience necessary!